BOSTON — During Aaron Hernandez’s double murder trial, the former NFL star’s lawyer wanted to drive home his point that the prosecution’s star witness was a “three-legged pony” whose testimony could not be believed. So he galloped like a horse in front of the jury. 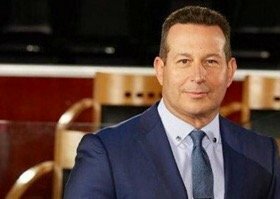 With Hernandez’s acquittal, Baez burnished his status as one of the most recognized defense lawyers in the U.S., six years after his high-profile gig successfully defending Casey Anthony, the Florida mother accused of killing her toddler because she didn’t want the responsibility of raising a child. His no-holds-barred style has won him both praise and scorn. 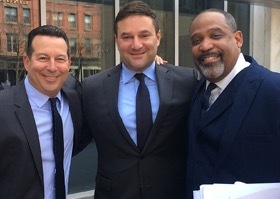 Prosecutors who have gone up against Baez say there is nothing he won’t do to win, while defense lawyers who have worked with call him a brilliant strategist who rips open holes in the prosecution’s case. “If you were ever in trouble, you would want Jose Baez by your side,” said Linda Kenney Baden, who represented music producer Phil Spector in his 2007 murder trial and has worked with Baez on three cases, including the Anthony and Hernandez trials. 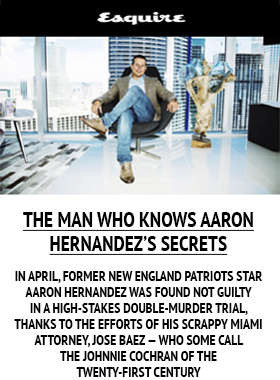 The Anthony and Hernandez cases initially seemed like slam dunks for prosecutors. Anthony had repeatedly lied to the police, and witnesses said they smelled a dead body in her car trunk. But Baez hammered at a hole in the prosecution’s case — uncertainty about how the little girl died — and raised doubt among jurors. In the Hernandez case, he relentlessly attacked the credibility of the prosecution’s star witness, an admitted drug dealer who was with Hernandez the night two men were killed in a drive-by shooting in Boston. Baez told the jury the man had identified Hernandez as the triggerman to get immunity and save his own skin. Baez, 48, based in Florida, was relatively inexperienced and unknown before the Anthony trial. While in law school, he had a one-day stint in the Miami-Dade County prosecutor’s office but said it “didn’t feel right” to him, so he walked across the street to the public defender’s office and offered to work there instead. During the Anthony trial, Fox News commentator Geraldo Rivera popularized the nickname “Juanie Cochran” for Baez, comparing him to the late Johnnie Cochran, the flamboyant lawyer who helped win acquittal for O.J. Simpson. Celebrity was something Baez never expected. He dropped out of high school and married his girlfriend after she became pregnant, and later earned his GED while in the Navy. After getting his law degree at Florida’s St. Thomas University, the state bar association prevented him from practicing law for eight years, citing his failure to keep up with child support payments and other debts. He was admitted to practice law in 2005, and just three years later took on the Anthony case. The trial fascinated the nation, with every twist and turn live-streamed and followed obsessively on social media and in the tabloids. Baez also represented Nilton Diaz, acquitted of murder but convicted of manslaughter in the death of the 2-year-old granddaughter of World Boxing Champion Wilfredo Vazquez. He also defended a 12-year-old girl charged with aggravated stalking in connection with the suicide of another girl. The charges were dropped. Baez said he has never lost a first- or second-degree murder case out of 11 that have gone to trial. He attributes his success to his ability to relate to jurors from all walks of life. Baez’s brash approach has sometimes angered prosecutors. In the Hernandez trial, the defense suggested that the victims may have been involved in drugs and gangs, and that the real killer’s motive was a failed drug deal. A medical examiner testified that there were drugs in the system of one of the victims. After the acquittal, prosecutor Daniel Conley said portraying the victims that way was unnecessary. Baez’s work didn’t result in freedom for Hernandez, who was already in prison for an earlier murder; Baez didn’t represent him in that trial. Five days after he was acquitted, Hernandez was dead of an apparent suicide in his prison cell. Baez’s work for his client didn’t end there. 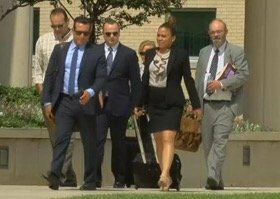 The next day, he claimed the state medical examiner was illegally withholding Hernandez’s brain, preventing his family from donating it to research. 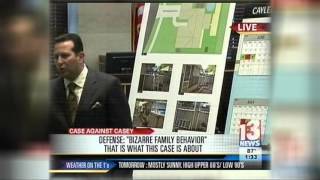 State officials denied Baez’s claim and said they held onto Hernandez’s brain only during an autopsy. I can now confirm that my firm has been retained to represent Mr. Aaron Hernandez in his upcoming trial. Mr. Hernandez strongly maintains his innocence, and I plan to establish that before a jury of his peers. I have fully committed myself to ensuring a fair and just trial for Mr. Hernandez. To accomplish this, I have assembled the best legal team in the country to serve as co-counsel. The legal team will consist of me, as lead counsel, Harvard Law Professor and criminal law expert Ronald S. Sullivan Jr., renowned criminal defense lawyer and trial expert Alex Spiro, and forensic science expert Linda Kenny Baden. We understand that numerous reports of our client’s alleged activity have been published, but we ask the public to afford Mr. Hernandez the presumption of innocence and let the facts unfold in a court of law. CC: Ron Sullivan, Esq., Alex Spiro Esq., Linda Kenny Baden Esq.